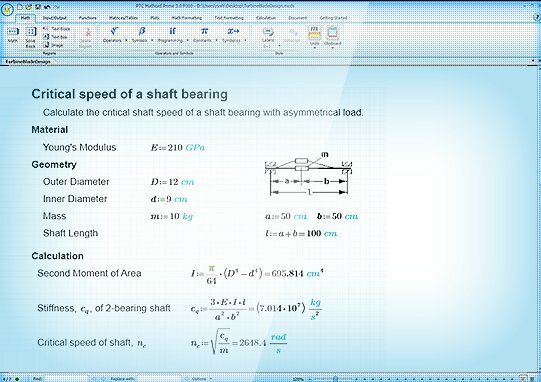 The Mathcad interface allows users to combine a variety of different elements (mathematics, descriptive text, and supporting imagery) into the form of a worksheet, which is naturally readable. Because the mathematics are core to the program, the math is inherently live, dynamically recalculating as value upstream are altered. This allows for simple manipulation of input variables, assumptions, and expressions, which in turn update in real-time. The examples below serve to outline the scope of Mathcad’s capabilities, rather than to give specific details on the individual product functionality. 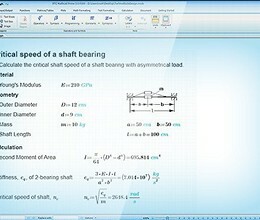 Import from, and export to, other applications and file types, such as Microsoft Excel and MathML. Although Mathcad is mostly oriented to non-programming users, it is also used in more complex projects to visualize results of mathematical modeling by using distributed computing and coupling with programs written using more traditional languages such as C++. Note: Mathcad Prime is a 30-day trial software but when the 30-day trial period has ended, it is possible to continue using PTC Mathcad Express for an unlimited time for free. * Mathcad download link provides trial version of the software. LISCAD is a portfolio of integrated Land Surveying and Civil Engineering software modules. Mathcad has been rated 5.0 out of 5 points. A total of 1 votes cast and 0 users reviewed the software.